The original Chai Masala – or Spiced Tea – comes from India, where spices are simmered for hours in milk before tea and sugar are added and the sweet rich mixture is served in tiny cups. 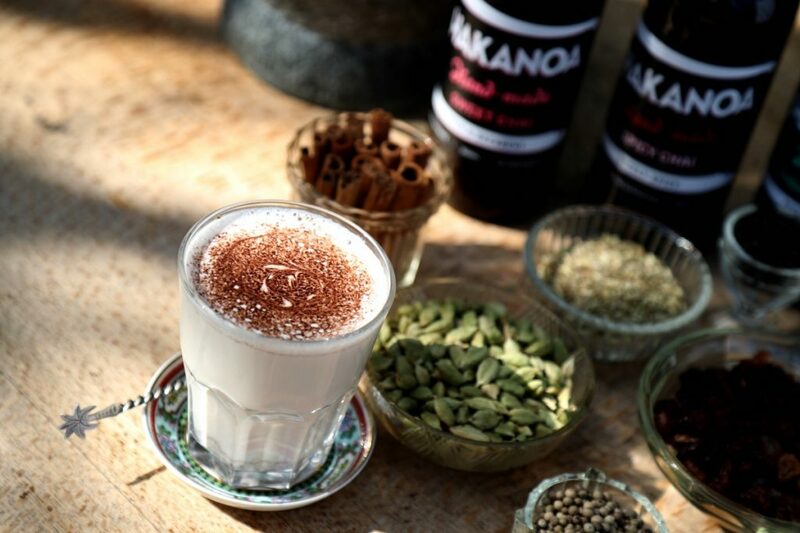 Hakanoa Chai Syrups are fresh spice and black tea concentrates designed to be mixed with hot textured velvety milk to make a Chai Latte. They also work with soy milk, most nut milks and are divine with coconut drinking milk. They can also be diluted with hot water to make a Chai Tea. Our SPICY CHAI is the result of a collaboration between Rebekah and Helen Ollivier, the barista who runs her Aotea Coffee Stand every Saturday at the Britomart Market. Helen vetted 9 recipes before she and Rebekah were satisfied with the results. Hakanoa UNSWEETENED CHAI (it was called SUGAR-FREE CHAI, but we’ve recently changed the name because people assumed we’d added a sugar-free sweetener like Stevia which is not the case) has a perfect balance of spice & tea when diluted in hot water. We add a touch of fresh lemon juice to all our Chai’s to make the mixture just acidic enough not to spoil. We balance that lemon flavour with a few organic sultanas, but we chose not to sweeten this mixture. The flavours may seem muted in high-fat milks, especially when compared to our other Chai concentrates syrups that do contain some raw sugar. If you would like to boost the flavours, add the unrefined sweetener of your choice – honey, date syrup, or coconut nectar all work nicely, or try a small pinch of salt in your cup.